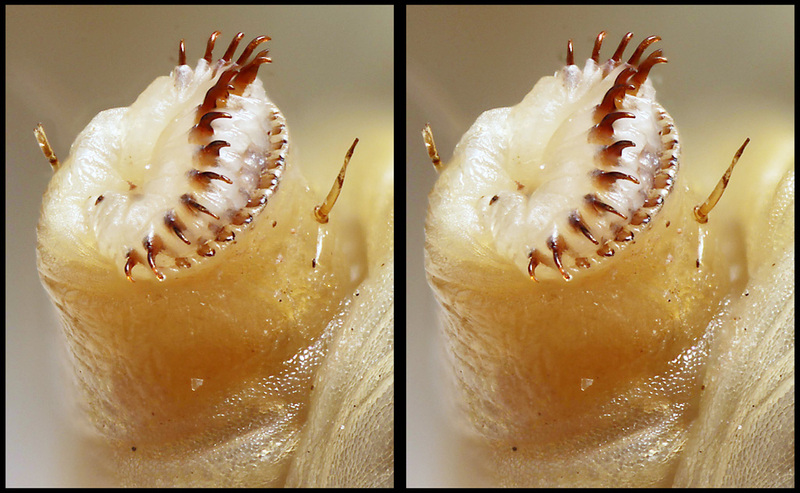 Ironically, this cutworm proleg plays a key role in presentations when I talk about why we do focus stacking at all. What you see here is processed from a stack of 52 frames shot at 9X with an Olympus 20mm f/2.0 bellows lens set at f/2.8 . Taking into account the pupil factor 0.75, this works out to be f/36 effective. Shot on 7/2/2010, Canon T1i, Olympus 20mm f/2.0 bellows lens set at f/2.8, step size lost to antiquity. Preserved specimen, dried by progressive dilution from water to acetone. Synthetic stereo rendering by Zerene Stacker, post-processed with StereoPhoto Maker. Frame width about 0.85 mm in the stereo pair. * At least, I never posted it out as far as I can tell. I never rule out the possibility that all my indexing and searching efforts have simply failed. Edit: to correct the f-number used for shooting. Very nice stack, what light setup was used ? To illustrate the effects of diffraction, I then show single source frames, stepping from nominal f/2 to f/16, effective f/26 to f/208. How are you calculating exposure for f/16 ? Trial/error ? Single frame enough or better use few of them, doing 16->11->9 etc. ? Synthetic stereo rendering by Zerene Stacker, post-processed with StereoPhoto Maker. 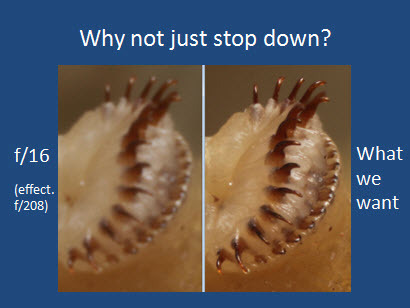 What are benefits using StereoPhoto Maker for synthetic stereo rendering by Zerene Stacker ? what light setup was used ? Continuous illumination, probably incandescent (considering the year), probably with paper diffuser. How are you calculating exposure for f/16 ? Trial/error ? Looking at EXIF data in the images, it seems I simply adjusted shutter speed starting at 1/10 second for f/2, in steps of 2X per f-stop. The EXIF data says 1/10, 1/5, 1/2.5, 1/1.3, 1.6, 3.2, and 6 seconds, for f/2, f/2.8, f/4, f/5.6, f/8, f/11, and f/16 (all nominal). Those were single frames. The only stack that I shot was at 1/5 second exposure. Exposure time and source image DOF for the stack matches the f/2.8 single frame, so I have corrected the aperture setting in my earlier posting. With synthetic stereo, I use StereoPhoto Maker mostly for cropping. In some cases I also adjust the left/right disparity so as to push the subject backward to reduce or avoid window violations. With true stereo (two physical viewpoints), I also use StereoPhoto Maker to fix misalignments due to toe-in and other camera pointing issues. It's nice that with synthetic stereo, those things never happen. Do we have some information what is the best way/workflow to retouch stereo pairs ? For example, after using spot removal tool in PS, looking at the stereo, I have artifacts around this place, because tool fixed left side little bit differently than the right side. I don't know a really good way to retouch stereo pairs. Mostly I try to avoid retouching them. My favorite technique for that is to show a large ordinary single image that may have been retouched as needed, combined with a lower resolution stereo pair that probably still has artifacts of various sorts. 2) cloning inside Photoshop from one left/right view to the other, to eliminate some artifact that appears on one side but not the other. The first one usually gives no great problem, perhaps because transparent foreground happens around edges, where there are always left/right differences anyway. The second one is trickier. It requires that the clone be done with exactly the same Y coordinates for source & target (because vertical disparities are always bad) and with a difference in X coordinates that corresponds to the depth of the surface at the place that cloning occurs. I attack this by using pixel coordinates shown in the Info panel to get the same Y coordinates, and doing local feature matching by eye to get appropriate X coordinates. If the points to be cloned are very far apart, then I have to open two windows onto the same image, so that I can have both the source and destination locations shown simultaneously and large enough to work with. All this messing around is time consuming at best. Worse, often I miss by a little in getting the appropriate X coordinate, with the result that the cloned patch then appears to sit in front or behind the surface, and I have to undo the clone and try again. It's clear that the process could benefit from some software support specifically to make left/right cloning simpler. What's not clear is exactly what that support should look like. I'm not aware of any other software package that already implements anything like this. If anybody else is, then I would greatly appreciate a pointer to it. Thanks Rik, like always your information is very helpful !